Meanwhile, make pudding as directed on box using milk; do not refrigerate. Crumble enough cookies to make 2 1/2 cups; reserve remaining cookies for another use. 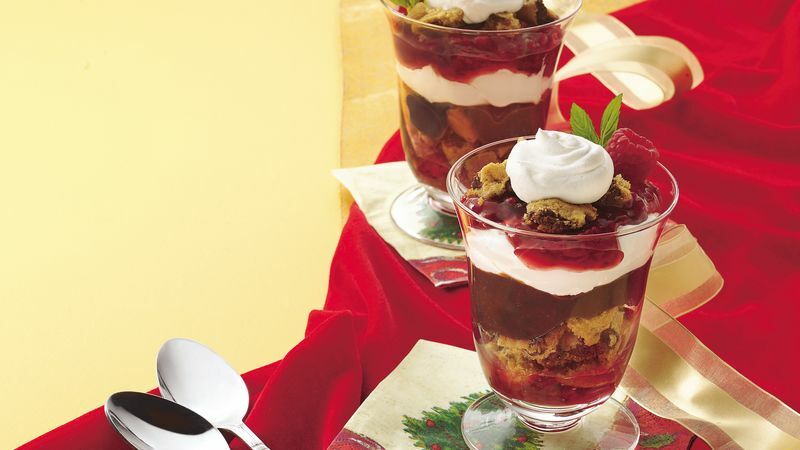 To assemble parfaits, in bottom of each of 10 (8-oz) parfait glasses or clear plastic drinking cups, layer about 1 tablespoon raspberry pie filling, 3 tablespoons cookie crumbs, 3 tablespoons pudding, about 1/4 cup whipped topping, 2 tablespoons pie filling and 1 tablespoon cookie crumbs. Top each with dollop of remaining whipped topping. These fancy parfaits are so easy and fun to make! Put your kids in charge of assembling them. They can be made up to 2 hours ahead and refrigerated until it's time to eat.